Colline, translated into English as Hill, was first published in 1929. It is the award-winning first novella written by Jean Giono, the French author, pacifist and ecological activist who went on to publish over 30 critically acclaimed works of literature throughout his life. Given this eminent and long-established reputation, it seems unnecessary and indeed brazen to write a review critiquing the style and structure of this book. In any case, Giono’s debut passed both of these tests with flying colours, managing as he does to entwine profound and edifying concepts, and refreshingly lucid imagery, all within a wonderfully rich 110 pages. Hill remains the product of a very particular view of the world. In the words of David Abram, “Giono’s vision is intensely – even overwhelmingly – ecological”, and this helps understand the drive behind this work. It is the first in a trilogy dedicated to Pan, the God of the wild, and the first glimpse into his lifelong musings on the philosophy of ‘animate cosmology’. Returning once more to the pertinent insight of David Abram in the NYRB edition, this form of fiction is one in which “human figures are fully a part of the wild and darkly breathing cosmos”. Perhaps, then, a more useful review would be one determining the applicability of Giono’s novella to the present day. Are its central tenets apposite, its moral demands pertinent? On this front, it seems strikingly obvious that any book advocating the sacrosanctity and might of Nature is one which applies to our environmentally reckless world. The fact that the author made this argument 90 years ago should only heighten our sense of gargantuan guilt at its contemporary relevance. It is unsurprising in light of Giono’s mentality that he chose his native Provence as the setting of his first delve into ecological fiction. On a hill in deep rural Provence stand the four ‘Bastides Blanches’ – White Houses – in which the residents of the book reside. They are social hermits who have chosen to live remotely, immersing themselves in the natural world rather than the human one. At the Bastides, subsistence, not affluence, is the way of life. Immediately, the reader gets the sense that the reward for this asceticism is unfettered access to the glories of the natural world. The book opens with an indulgent description of the “land of the untamed”, where “the garter snake coils… the squirrel darts… the weasel jabs… and the boar groans under the junipers”. This unhurried natural imagery becomes integral to the book’s essence, as Giono never neglects his self-subscribed duty of maintaining the equality, if not superiority, of the natural world to the one of Man. It takes some getting used to, as the weighty precedent of antecedent literature has taught readers to expect symbolic allusion or vital revelations from the descriptive deviations which interrupt the giddy speed of plotlines. Rarely do authors describe because they merely wish to describe. Giono reminds us all of the power of the poetic in prose. Things, however, soon start to go amiss. The group elder, Janet, is suddenly struck bed-ridden, paralysed save for his tongue, which produces incoherent and unearthly utterings. An unseasonal storm soon follows, seemingly threatening to cleave the world apart. When sightings of a black cat occur, fear at its zenith grips the primitive residents, condemned to superstition by their sheltered lives. Giono is coldly effective in conveying this mounting paranoia through a definitive shift from benign imagery to that of a malign natural world taking up arms against a trespassing community. At this point, Jaume, who develops into the hamlet’s leader, has an epiphany. On a reconnaissance mission of the surrounding areas, searching for clues as to the cause of the escalating menace, he kills a lizard. Soon after, he sickens at the thought of his deed, realising with loathing how “man wants to be the master-beast, the one who kills”. In this moment he comprehends that the world around is alive just as much as he is. If they do not treat it with respect, it will turn against them. Indeed, it already has. Reading this review, one might now roll one’s eyes at the predictable, clichéd message just espoused. And, to an extent, this is fair. Giono ultimately was an environmentalist, and a firm believer that we must learn to live better within Nature in a symbiotic, non-destructive way. To express otherwise would be a betrayal of his own ethics. Yet Hill does not end quite as inevitably as this. Although the residents of the Bastides rectify their actions based on this revelation, the natural world continues its onslaught. The daughter of one family falls seriously ill, and a devastating fire reaps through the countryside. In loyalty to the patriarchy’s hierarchical deference to elders, Jaume seeks help from Janet, which becomes the main didactic section of the novella. Rather than coming to the aid of his relatives and friends, Janet assaults human arrogance. “You haven’t spent enough time watching animals die”, he says, casting reference back to Jaume’s lizard epiphany, which ultimately dawned too late. “Earth isn’t made for you alone”, the edification goes on, and “if he wanted to wipe the Bastides right off this tiny bump of a hill…it’s no big deal”. Four pages into this sermon and Jaume appears to get the message – “he can feel the hill – alive and terrible – moving under his feet”. Janet therefore comes to represent Nature’s rage in its Manichaean duel with Man. Unlike the harmony portrayed at the beginning of the novella, the two worlds are at war, and it is Giono’s firm belief that the latter is fully to blame. The fire – conveyed in yet more august imagery as a “devil”, reminiscent of grandiose Virgilian metaphors – is the final plague sent by Mother Nature as a cathartic cleansing of our ignorance. Whether or not further punitive lessons are necessary is solely reliant on our capacity to improve our regard for nature. The author’s opinion, as is evident in the book’s final pages, is that we will not. Hill is a powerful allegory of the threat which humans seem hell-bent on posing to the environment. True of 1929, it is certainly more-so now. Its greatest strengths remain the abundant, rich imagery and perspicacious portrayal of community interaction. One cannot but feel, however, that Giono’s overhanging message is rather puritanical. If a handful of families living in the wilderness far away from society leave a malicious footprint on the earth, then what hope do bustling towns and industrialised cities have? There is nothing wrong with this caution per se. We may in fact come to realise that it was fully warranted. Nevertheless, one thing is certain; if Jean Giono saw grave danger in the treatment of Nature in 1929, its annihilation at the hands of contemporary society will be making him turn in his grave. Jean Giono (1895–1970) was born and lived most of his life in the town of Manosque, Alpes-de-Haute-Provence. Largely self-educated, he started working as a bank clerk at the age of sixteen and reported for military service when World War I broke out. He fought in the battle of Verdun and was one of the few members of his company to survive. After the war, he returned to his job and family in Manosque and became a vocal, lifelong pacifist. After the success of Hill, which won the Prix Brentano, he left the bank and began to publish prolifically. During World War II Giono’s outspoken pacifism led some to accuse him unjustly of collaboration with the Nazis; after France’s liberation in 1944, he was imprisoned and held without charges. Despite being blacklisted after his release, Giono continued writing and was elected to the Académie Goncourt in 1954. Paul Eprile is a longtime publisher (Between the Lines, Toronto), as well as a poet and translator. He is currently at work on the translation of Jean Giono’s novel Melville (forthcoming from NYRB) and lives on the Niagara Escarpment in Ontario, Canada. Hill is published by NYRB Classics. Author and translator bio courtesy of the same. 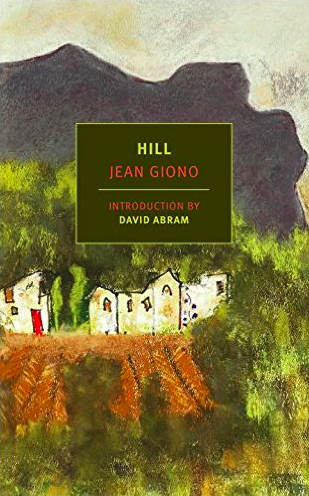 Posted in Book reviews and tagged ecological destruction, Hill, Jean Giono. Bookmark the permalink.